Karen Fortier runs Rain Spirit Farm in Monroe, Washington. She conducted a case study regarding the use of Critical Care for Herbivores with a hand-reared wallaby after a relocation, anorexia, and collapse. 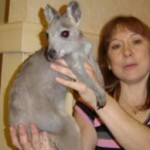 Intent of product use: To restore health of a four-year-old pet wallaby, unable to eat on his own. Also, to determine if Critical Care is a workable solution to feeding animals unable or unwilling to eat due to injury or illness. How was the diet altered? Previous diet consisted of 1.5 cups of Mazuri wallaby diet, 1.5 cups of Del’s senior equine feed, 1.5 cups of vegetables (yams, apples, and carrots), 1 cup rolled barley, free choice alfalfa hay, and water. Diet was changed to three TBSP of Critical Care, mixed with water, and given nine times throughout the day. Describe any successes or problems: Food was readily consumed and provided sufficient fiber to prevent diarrhea, even when animal was down. Also increased strength and vitality. Food was easy to prepare and feed using syringe. There was a noticeable improvement in his strength, and coat shedding decreased during the field trial. Palatability tests with the product were done with my donkeys. They loved it, taking it readily from my hand or a pan. Then I tried a little bit with the llamas and goats. Again, they thought it a real treat! This product is terrific. It did an excellent job of providing nutrition to an animal unable to eat on his own. Since he liked the taste, there was no struggle to feed him and thus caused less stress than previous tubing efforts. He enthusiastically reacted to feeding, and was chewing the food readily before swallowing. He became stronger and more vigorous by the day. He began to care about living. Despite his unwillingness to eat anything else except Esbilac, and despite his recurring bouts of colic, he never refused the Critical Care. This product has widespread application for me, as I own llamas, donkeys, goats, ostrich and wallabies.